Manhattan on WGN and The Divide on WE, reviewed. Dramas on WGN and WE epitomize the flood of totally decent television. Christopher Denham, Eddie Shin, Harry Lloyd, and Michael Chernus in Manhattan. If you’re a regular TV-watching citizen, the steady stream of remarkably decent dramas is nothing but a good thing. Wherever you look, perhaps on some cable channel you have never heard of, a surprisingly solid drama is airing. But speaking as a TV critic, the ongoing flood of totally decent television is punching leaks in my roof. I have buckets under the ceiling and the windows and I have to find time to empty them all. I am well aware that there does not exist a violin in the world small enough to play for the TV critic awash in reasonably well-made television, and yet please, tiniest being in the world, play it for me, as I try not to drown in all the TV good enough to watch. The latest entrants in the “surprisingly solid drama” category, Manhattan and The Divide, come from two networks that have just gotten into original programming. Starting this Sunday, WGN, a Chicago-based network best known previously for televising Cubs games all over the Midwest, will air the historical drama Manhattan, as in the Manhattan Project. The show is set in 1943 in a hopping, secret desert pop-up town, where hundreds of scientists and their families are gathered under the command of J. Robert Oppenheimer trying to build the first atomic bomb. John Benjamin Hickey stars as Frank Winters, a stressed, scruffy, persnickety scientist overseeing what, in this desert outpost, amounts to the Bad News Bears. 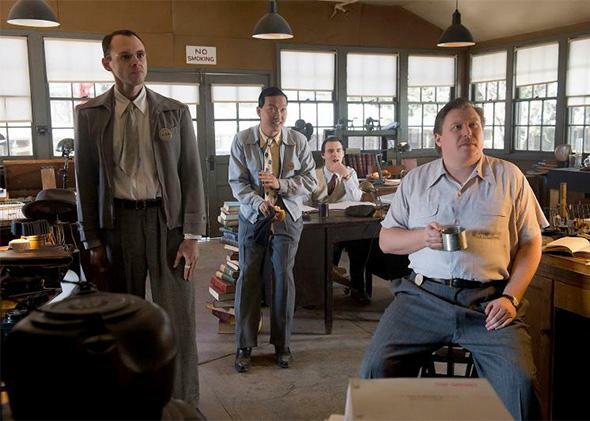 He and his small team—which includes an old guy, a woman, an Asian man, a Brit, and a bunch of mouth breathers—are trying to get funding and attention for their version of the bomb, even though Oppenheimer, the president, and the army have faith in the slicker Reed Akley (David Harbour) and his much bigger, better funded team. “This is Shangri-La,” a scientist tells new arrival to Reed’s team Charlie Isaacs (B.J. Novak lookalike Ashley Zukerman). “The highest combined IQ of any town in the country and more Jews than Babylon. You’ll be wined and dined by the U.S. Army ’til Hitler and the Japs say uncle,” something that all these brains assembled in the middle of nowhere are going to make happen. Manhattan is a high-stakes historical thriller—the series begins with a countdown: 766 days before Hiroshima—but with some more grandiose ambitions. It doesn’t only want to be an extremely detailed race against the clock but an exploration of secrecy and suspicion. The male scientists have clearance. They know what they are building and why. But their wives, the support staff, and regular GIs do not. The army is vigilant about keeping it this way, harshly cracking down on espionage and leaks, preserving the integrity of the Manhattan Project even as it undermines the integrity of every marriage on the show. Secrets may be necessary for winning the war, but they are hell on relationships. As a thriller, Manhattan mostly works. We know what will happen—they’ll build the bomb—but the how, the twists and turns, the breakthroughs and bolts of luck, supply the necessary momentum. But as a psychodrama, Manhattan has a built-in structural problem: The women are clueless. Frank’s brash, brilliant wife Liza (Olivia Williams) has a Ph.D. in botany and keeps wondering why they can’t grow corn on the base. The land is radioactive, but no one is telling her that. Liza spends much of the first two episodes begging Frank to unburden himself, but he is so consumed with the number of Americans soldiers dying, he will not lay down his burden however much it wears on him. Charlie appears to tell his wife about the bomb, but after she is peer-pressured by the other wives into saying what she knows, it seems he just might have been smart, scheming, and condescending enough to lie to her about it. Either way, all of his internal angst about the weapon—how many civilians it will kill, who will use it in the next war—isn’t the kind of thing he shares with his wife, just his colleagues. Life may be difficult out in the desert for the women, but if they knew the half of it they probably wouldn’t complain so much. 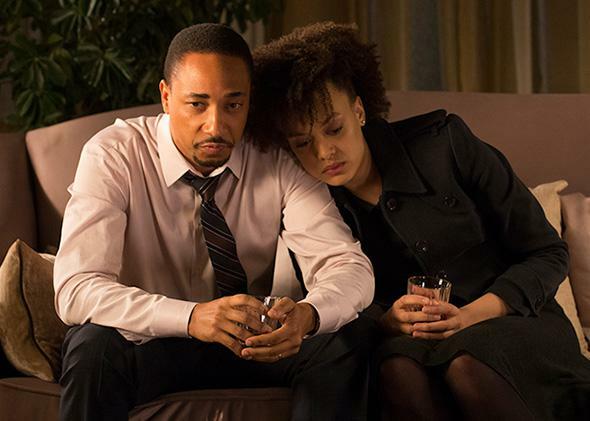 The Divide is a show about a highly racial crime, but it does not utilize race simplistically. The Divide, airing on Wednesdays, is a new crime drama from WE, another newly minted original programmer. The show was developed at AMC (a sister network to WE), who opted not to make it a series—a fairly absurd decision considering that, by even a conservative estimate, it is at least 10 million times better than recent AMC crime drama Low Winter Sun. The Divide is unshowily good. It’s serious minded without being self-important (please ignore the opening quotes from Nietzsche and Cervantes), dedicated to ambiguity without prattling on about all the grays in the world, and devoted to verisimilitude without underlining and circling and highlighting its dedication to the same. The Divide is set in Philadelphia, where decades ago an affluent black family was brutally murdered by two white men, one of whom, as the show begins, is on death row, and the other is still in prison. The men were convicted by Adam Page (Damon Gupta), a genuinely upstanding DA, on the strength of both DNA evidence and the eye-witness testimony of Jenny Butler (Britne Oldford), the one surviving member of the family who was then a small girl but is now a troubled young woman who is very close to both Adam and his wife Billie (Nia Long). The case comes to the attention of the Innocence Initiative, where the show’s main character, Christina Rosa (Marin Ireland)—a particularly fiery soon-to-be-lawyer with a personal stake in overturning convictions thanks to a father in jail—becomes obsessed with it. Working with her boss Clark Rylance (Mark Schneider) she gets the DNA evidence retested. The results don’t come back in time to keep the death row inmate from execution, but they do blow open the case. One of the most appealing things about The Divide is that, thus far, none of its lead characters appear to be evil geniuses. Both the DA and the Innocence Initiative are proceeding honorably. Adam, when he hears about the new DNA results, has all of the evidence tested again: He is not some suit who wants to keep an innocent man in jail just to protect his reputation. Two episodes in, there is the intimation of a vast conspiracy, involving the cops and Philadelphia’s richest men, but the protagonists are at a distance from it. The situation, the crime, the courts, guilt and innocence, the difficulty of certainty are all complicated enough that the story doesn’t need some nefarious genius to give it oomph. The Divide is a show about a highly racial crime, but it does not utilize race pruriently or simplistically. Adam and his family are affluent and black; he and Billie, a fierce woman, have a good marriage, and a teenage son newly alive to girls. Adam is close with his father Isaiah (Clarke Peters, aka Lester Freamon), a former cop grieving the loss of his wife and Adam’s mother. The only character on the show from a broken home is the white Christina, who has a working class background, and whose father is currently in prison for allegedly murdering her mother’s fiancé. In the pilot, Christina tries to make a connection with Jenny in order to get the execution stayed: Jenny sees through Christina’s motives, but the two, living with the long-tail of horrific violence, actually do have something in common. All the pieces are here, not just for a real potboiler, but a satisfying character piece, the sort of show that can flood my living room anytime.